Wow, the weather has really been wild! Wind, snow, windy, briefly warmish, snow. Repeat! Gonna get real cold and wintry again in the near future, but spring will come, indeed. Next weekend is the return of Daylight Savings Time. Waiting for a break in the weather to get my cold frame seated. Might start some lettuces and Chard inside tomorrow. I think I am going to try the spinach in the cold frame, since I have always had such voltage issues with it! What else is going on, Midwest? LOL! I'm going back to gardening in containers on my balconies. 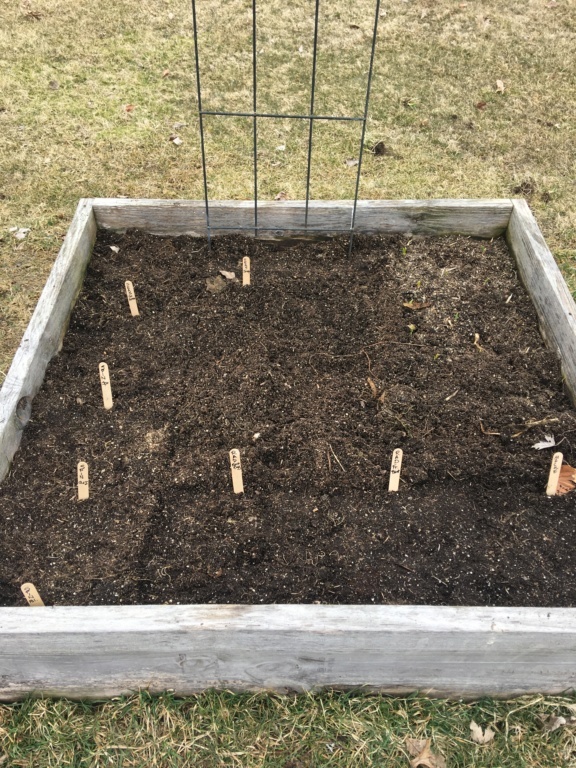 I will still have one nice sfg bed next door with our daughter, and the "Salad Bar" tabletop "keyhole" garden, but there's no place for a veggie garden at our new place without "sharing" with the deer, so containers it will be this year. You will absolutely love the tabletop bed. It takes gardening to a whole new level. The best part is that you can garden with both hands. No more leaning over and supporting yourself with one arm, while trying to do everything with the other one. I love my table top beds. They are only 2' tall but the perfect height for tending and harvesting. As Countrynaturals stated "It takes gardening to a whole new level." Literally as well as figuratively. @Scorpio Rising wrote: Wow, the weather has really been wild! Wind, snow, windy, briefly warmish, snow. Repeat! Gonna get real cold and wintry again in the near future, but spring will come, indeed. It was 7°F this morning here in the SW corner of Ohio, with a projected high of 20°F today and tomorrow. March definitely came in like the Lion! Doesen't seem much like Spring, but it should be settling down soon. At least I hope so, I have a lot of gardening and yard work to do. Lol, my original note said I have “voltage” issues with my spinach, instead of boltage, that;s funny! @Scorpio Rising wrote: Lol, my original note said I have “voltage” issues with my spinach, instead of boltage, that;s funny! But then, Spinach does give one quite a charge! @Scorpio Rising wrote: Wow, the weather has really been wild! Wind, snow, windy, briefly warmish, snow. Repeat! IIRC, even after the first week, in March, 2007, I remember the temp going to the 60s, then within a few days, only 32 F or the like with snow. I don’t know, but seems like the weather really is changing...noticeably so in a fairly short time frame. Today seasonable, 40-ish. Windy. Gonna read my notes and get some seeds going in the basement! We are having the same weather here in Nor Cal. Yay! Spring is a coming!!! Baby Bok Choi is up! Lights on! Also will get seeds in for basil. And dill. Seedlings are up, some of them! Also today filled my starter up with 2 Ping Tung eggplants, basil (4), dill (2), marigolds Cottage Red and Nasturtium Meastro mix, 2 each. I started seeds today. Tomatoes, basil, catnip, parsley, kale, swiss chard and lettuce. @nrstooge wrote: I started seeds today. Tomatoes, basil, catnip, parsley, kale, swiss chard and lettuce. Freshness of seeds is a big deal; So I have my little seed starting thing going on in my basement...my older, favorite seeds are obviously suffering due to elderliness! Dang it!! @Scorpio Rising wrote: suffering due to elderliness! That is a condition I can relate to! 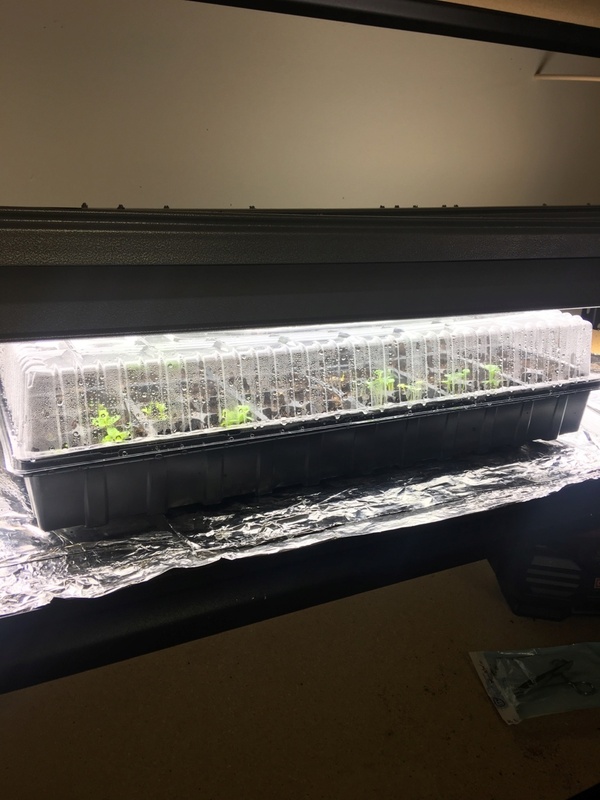 OK, little rant; some seeds starting in basement on heating pad and lights, T8s. Went 45 miles to Home Depot today to get my coveted Red Cottage marigolds. First weekend nice day here! Just cleaned out the 4x4, planted sugar snap peas, Green Arrow regular peas, spinach, mache, and radishes. Garlic peeking up in the back right 2 squares! Another beautiful spring day here in SW Ohio! Planted some radishes & spinach in one raised bed, and started some tomato & basil seeds indoors. Spread four 6f3 wheelbarrow loads of coffee ground on the flower beds - been collecting and saving the Starbucks coffee grounds all winter, and now the drums are empty again.